Jason Crane interviews jazz journalist Marc Myers about saxophonist Bud Shank’s early influence on bossa nova. 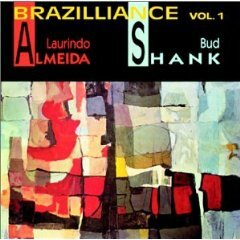 Although largely forgotten by modern bossa nova fans, Bud Shank’s band with guitarist Laurindo Almeida was at the forefront of the Brazillian-folk-jazz movement. Their early records ended up in Rio de Janeiro, where Antonio Carlos Jobim, Joao Gilberto and others listened to them and turned them into bossa nova. Find out more at Marc Myers’ excellent site, jazzwax.com. Love hearing Jason and Marc talk about the true birth of the first Brazilian/Jazz Fusion, as they called it in an article from a 1962 Downbeat I have, “jazz baiao”. Those guys were simply experimenting with sound, which is what my father did all of his life…. Thanks, Von. I’m looking forward to talking at length about your father when we record our interview.